Collecting ERC20 balances from multiple addresses? I'm building a dApp that involves creating unique accounts for individual users for ERC20 deposits [I keep the addresses and private keys in a centralized database], for popular ERC20 tokens like BNB, 0x, etc. However, to function, my dApp needs to collect all these balances into a central wallet. Since these are ERC20 deposits and not ETH deposits, the user wallets have no ETH deposited in them and therefore will have no way to pay for the gas to send their ERC20 balances to the central wallet. Does anyone know an efficient solution to this problem? My naive solution is to just send ETH into a user's wallet every time I detect an ERC20 deposit into that wallet, so that said wallet can pay for the gas to transfer, but this is ugly and seems like a lot of overhead in gas. Generate wallet keys / addresses that your users transfer to, and you have to send gas to those addresses in order to move funds. Deploy a smart contract factory that generates a "receiving address" that the main "account can control". In essence you have a smart contract that creates new addresses that store received funds, and you have an "owner" address that can call a method to transfer funds. 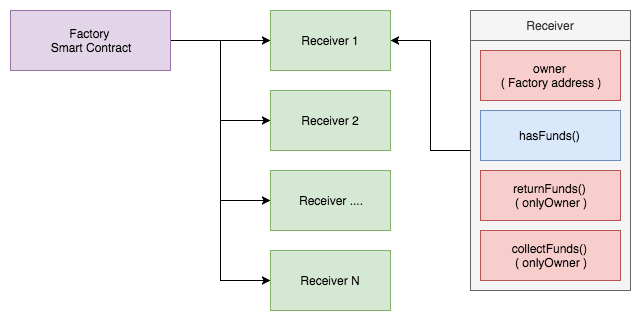 The Factory contract, can implement ownership validation and control the receivers, or each receiver could do the validation itself. the owner can create new "receivers"
Think about having a separate server that does the signing, you could even have an external hardware wallet plugged into this, or an HSM ( Hardware signing module ). The awesome part here is that you can even implement this in such a way that you can collect tokens from any Ethereum based smart contract / token tracker ( BNB / DAI / etc. ) or any token standard using a custom caller interface ( you can call arbitrary methods at any address you want ). No need to send gas to these receivers as the owner is the one "sending the transaction" and the "receiver contract is the owner of the tokens"
Cheap gas for deploying and interacting with receivers, since you can do it when the network is not congested, as well as the ability to integrate with GasToken ( gastoken.io ) to lower your price even more. I can't comment yet, but it would be helpful if you posted some code. Transferring all balances to a central wallet would not be possible unless you controlled the keys of every user wallet. This would require an off-chain data store to manage key implementations and could prove a security risk say those keys were ever divulged. Technically, in the case of an ERC20 token, the tokens never move from the contract, but rather the balances are updated within the mapping of balances in the contract itself. So if you wanted to centrally control them, you could add an additional function to the ERC20 contract, which would make it no longer standard compliant, but would allow you to add in admin privileges allowing you to alter the token balances as you needed to. Not the answer you're looking for? Browse other questions tagged erc-20 dapps ethereumjs dapp-design or ask your own question. How to track ownership of a real-world object?